Park Yuchun found the feeling. With just 2 episodes of SBS’ Rooftop Prince aired, he has grasped his sense of existence firmly. From the anger and sorrow of losing crown princes, to the acting that express comedy in details, the variety of the Park Yuchun’s roles have captivated many viewers. In term of the boundary of actor who ‘originating from idol,’ his acting has evolved for the better. And this is the reason for those idol actors who always been labeled with ‘acting controversy’ to learn from him. Many idol singers and idol pop groups been born everyday, and unknown since when, many of them takes it for granted and crosses over to debut as actor. Is it because of the desire of idol singers who want to expand their areas, happen to coincide with the interest of production teams who want to make sure of ‘fame’ of idols? As such, the so called ‘idol actors’ started to land leading roles in the drama despite their lack of acting skills. According, the controversies on their acting is the result goes without saying. The stage is too much for them who is lack of basics and without acting experience. The best example is recently concluded Dream High 2, which was condemned by viewers due to the clumsy acting of the idol actors. In the past, the persons who were involved in acting controversy including Kim Hyunjoong and Suzy who had shown dull acting as if ‘reading national language book,’ U-Know Yunho who was criticized to have exaggerated expressions, and Kang Minkyung who always had the same facial expression and voice. 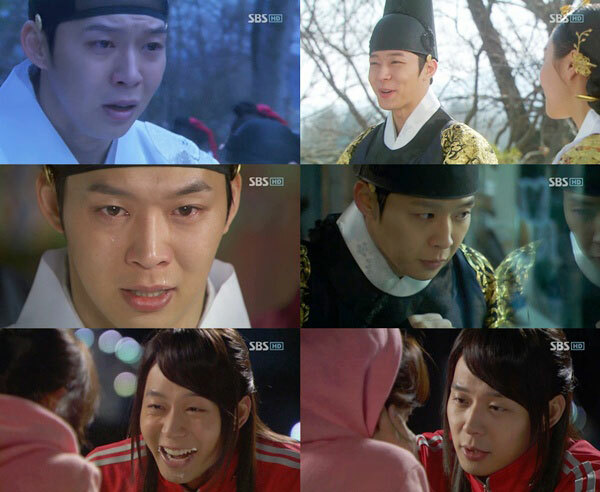 On the contrary, Park Yuchun of Rooftop Prince, as the hero of the drama series, has been performing the role very well. From the steady courage to funny expression, Park Yuchun has delicately expressed them. In the plot of episode 1 and 2, Park Yuchun perfectly interpreted the crown prince who is completely in sorrowful state after losing crown princess with extreme pain. His lines and acting when shouting angrily brought audience into the drama. The meticulous comical acting of Park Yuchun is also one the fun of watching the drama. Staring at others’ bowl because of hungry, or the disappearance of majestic and having to live under Han Ji Min’s eyes under her intrepid reproach. Another point worth paying attention to about acting of Park Yuchun is rapid improvement. From the debut drama, KBS2’s Sungkyunkwan Scandal to MBC’s Miss Ripley, he has been praised with stable acting. And in Rooftop Prince, his acting becomes even more expressive, fine and smooth. His handling of lines also becomes more stable and suitable. Today Park Yuchun has understood how to control the dynamic of acting, and also obtains the ability to lead a drama. Viewers want to see good acting. The expectation for idol actors is the same. The controversy and prejudice that have been following the acting of idol actors, perhaps are attracted by themselves after all. When can they get rid of acting controversy? If the idol actors can do as Park Yuchun, then the bias label of ‘idol origin’ that blocks in front of them, may be will disappear.